And I must admit I think it makes a gorgeous card, I am sure her cousin is going to love it. While we were looking for colouring card options we spotted the Illuminated Letter cards and both my daughter and I thought they would make stunning Birthday cards (we went with the idea of selecting the starting letter for the Birthday person). We started off with printing them on coloured card and using our new sharpies to colour them in. Which worked really well. But then we also thought it might be fun to add some of our dimensional paint (yes we do love our dimensional paint here). This time we selected the simple version of the letters and we only outlined the letter with the dimensional paint – we thought it would make the letter stand out more. We left our dimensional paint to dry overnight (it does smudge if you do not let it dry properly) and then we completed the card with our watercolours. And once we saw the outcome the kids decided to try the dimensional paint on a few more cards – we stuck with just outlining the focus point, leaving it to dry and the using our watercolour paints. The one below is the elephant scene card. I must admit I think we have a new favourite way to make cards (I have a strong suspicion that a number of our Christmas cards are going to be made this way this year). The dimensional paint that we use is this one – I Love To Create Tulip 3D Fabric Paint 4oz Slick (Black) . 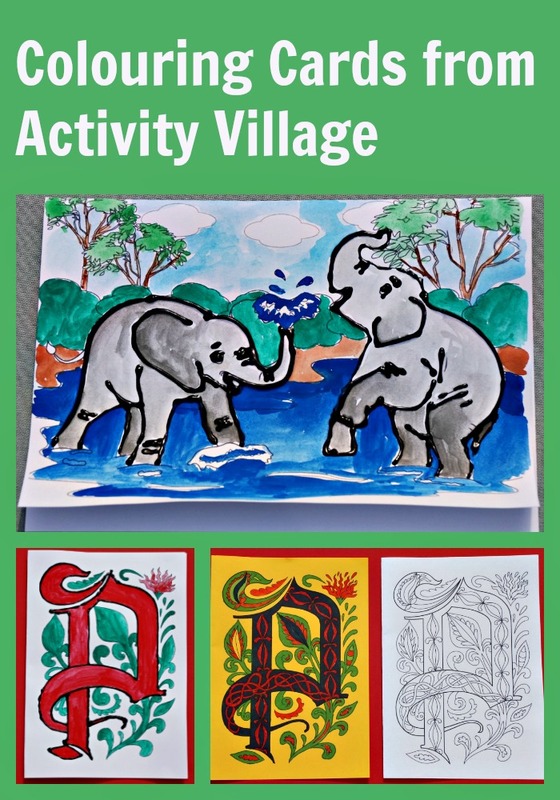 This entry was posted in Art and Craft Ideas and tagged activity village, children's art, colouring cards, dimensional paint, home ed, home education, homeschooling. Bookmark the permalink. I love the idea of making your own cards! These are fantastic! Just love those elephants…..well done children….